The sun was shining down on the streets of London as the fashion elite descended on the city, showcasing their best street style. With five days of style inspiration, the capital was the place to be. We took to the streets to capture all of our favourite style moments. The most organic part of fashion week takes place a world away from the glamorous runway. Far from the industrial lighting, glam teams and supermodels, sartorial splendour was occurring in the streets. It’s not only the runway which announces fashion forecasts. The streets were privy to trends we are sure to see multiplied in the coming months. The Strand was littered with industry leaders and celebrities leading in the latest looks. From power suits to micro bags, the pavements were full of versatile looks. One of the biggest looks we saw time and time again was the use of tonal layering. It also seemed like there was a style memo that went out that said: beige is the new black. With statement spring styling around every corner, we joined the hoards of photographers to shoot all of our favourite looks. EFFORTLESSLY COOL, Amaris (@my.big.diary) seriously nailed monochromatic styling. Statement stitching on the denim and an on-trend bumbag easily matched the cut-out ankle boots on display. Contrasting with the edgy setup, the traditional ruff-inspired neckline and puff sleeves of the shirt are what really sets this look off. DEMANDING ATTENTION with an edgy print, Vitoria (@vitoriacarolsouza) manages to incorporate three trends in one without looking overdone. Animal print is one of the biggest street style trends out there this year and here it’s been used on a statement power suit. With neon being a big trend prediction for the coming season, here it has been subtly used to finish this look off. YOU’VE HEARD of power suits, now let me introduce you to power pastels. The androgynous structure of the power suit has been given a dose of femininity with pastel tones. Softening the pressed creases, @_amallay created a look that is not only a hit with us but also nails tonal layering. The teddy-fabric jacket adds texture alongside the buckled PVC boots! NEON IS BACK. Easy to create, this look simply consists of a band tee and a neon quilted jacket. With a blend of eighties and nineties elements, Dimitry’s (@Dimitrydino) style somehow radiates contemporary fashion. LAVENDER HAS to be one of the prettiest spring colours going and we are obsessed with Nikki Oji’s (@nikkiojiwears) take on the trend. The cigarette trousers give off a lilac power suit vibe and perfectly frame the curated look. Accessorised with a tonal blouse, Gucci-inspired belt and fur detailing. This tonal and textured get up has to be one of our favourites for the coming months. ANIMAL PRINT is a trend that I will forever support. It’s quirky and fun, allowing you so many versatile styling options. With a unique way of styling, @Gaubrielo has shown us how it’s done. Some may feel animal print is tricky for men to wear but this jacket and hoody combination really adds an urban vibe that feels naturally cool. MINIMAL STYLING is one of the easiest and chicest styling options. Charmaine (@lovee_charms) and Samira (@dollfacesxmira) really played with tailoring in their looks. Khaki has been huge the past few seasons and Charmaine has styled paper bag culottes with a fisherman knit and baker boy hat, touching on the military trend. Samira opted for an all-black ensemble with trousers with athleisure-inspired elastic cuffs and militaria style Dr. Martens. She topped this off with a mid-thigh length grey duster to contrast with the all-black. A CLASSIC ADDITION to any wardrobe, for any gender, a trench coat. Incredibly versatile to style, a trench is a perfect piece to layer up. Effortlessly stylish, simply slipping one on will add an instant verve to your whole look. A TREND THAT hasn’t gone away since 2015, militaria. One of the biggest looks to come through this season is the chunky army boot. Taking inspiration from the industrial style of Dr. Martens, these boots have been embellished with buckles and stud detailing. Carefully framed by the rolled up sequin leggings, these boots stole the show. YOU KNOW US, we love a jacket and this one really caught our eye. With a four-button, double breasted placket, this jacket easily matched the soft tones of the chinos. Accented with a yellow check pattern that matches the tie, this suave and sophisticated look is timeless for men of all ages. TONAL PAIRING a must this season. Everywhere I turned there was a tonal look captivating a crowd. A high waist midi skirt, paired with the long sleeve crop top has simply contoured the waist and accented her curves. The embellishments to the neckline adds a touch of glamour to a block colour outfit. THIS HAS TO be one of the prettiest hairstyles we saw over the weekend. Wrapping a scarf around a low ponytail adds a touch of Parisian chic. The red silk design stands out against the minimal white blazer, giving the look a romantic edge. WE’VE RECENTLY raved about the versatility of grey trousers and how they can offer you so much more than a work outfit. This look is Exhibit A. While these grey woollen trousers feature a subtle pressed crease to the leg, he’s styled them in a way that distracts from the uniformed structure. A biker jacket, commonly seen in off-duty styling, manages to tone the trousers down. From the front, he had also teamed a pair of black braces and matching tee. ARGUABLY THE most stylish girls seen over the weekend, Olivia and Alice (@oliviaandalice_) were lucky enough to be styled in Simon Mo’s latest collection that showed on Sunday. Keeping to a refined colour palette, these layered looks complemented each other while still exuding individuality. The reconstructed shape of the jacket and grey trousers keep to a contemporary style while the check motif touches on sixties styling. NOW IF I saw one Dior Saddle Bag, I must have seen one hundred. Every year there is always a ‘must-have’ designer bag everyone lusts after, previously we’ve had the Celine Luggage bag and Saint Laurent Sac De Jour, just to name a few! She has made her outfit around the bag, using a beige duster coat as a frame. Now, remember beige is the new black and this whole outfit was duplicated by the masses as it radiates a chic transition of the seasons. RELAXED, COOL and quirky. Keeping a tonal tie with orange checked trousers and a highlighter orange hoody, this guy has set it off with a black contrasting bum bag over the chest and an odd-ball bobble hat which shouldn’t work but it just does. TEXTURES ARE everything when layering and she has nailed it. Leather trousers, a black turtle neck and a belt is an easy and timeless outfit but it isn’t breaking the internet. To add a dose of excitement, she has thrown on a pink textured jacket which sits just below the knee, framing the belt and block colours. TEDDY COATS were out in force on the streets, they are definitely the chicest way to stay warm in the city. This teddy has been accented with an on-trend circle bag that has been designed with a textured snakeskin print. The neutral tones of the bag really stand out against the vibrancy of the coat and the shoulder chain embellishes a jewellery free outfit. MATRIX-STYLE sunglasses have been a statement since last year, with supermodels and celebrities frequently sporting them. These sunnies are setting off a block-colour look that features a ribbed turtle neck. This extends her neckline while the longline duster draped around her arms compliments her torso and face. WITH FESTIVAL season right around the corner, rain macs are back in the game. As you can see, this matte transparent mac gives off an urban vibe which still allows your original outfit the attention it deserves. PSYCHEDELIA IS here in full force with electric neon tones. Neon was layered on neon, animal print with neon, and here, neon setting off an all black outfit! One thing my mum has always said is ‘when in doubt pair your shoes with your bag‘, it creates an outfit that quickly pulls everything together. Statement boots are huge right now, the quirkier the heel, the better. COMPLETELY AWAY from Fashion Week, we spotted workwear on the move and couldn’t resist capturing it! Slim-fit chinos and form-fitting jackets are a great combination when commuting into the city. ANOTHER ROUND of neon tones paired with beige and subtle animal print. It’s fair to say beige was definitely the colour of Fashion Week. Incredibly wearable, beige dusters are a staple that your wardrobe is crying out for! WE SPOTTED Eyal from Love Island (@eyalbooker) outside Freemasons’ Hall. Sporting what we are calling the ‘trucker’ look, Eyal wore a crew neck sweater with a box-fit shirt. The contrasting over shirt featured distressed seams, contrasting stitching and an asymmetric collar. ANOTHER AMAZING combination from Olivia and Alice (@oliviaandalice_). 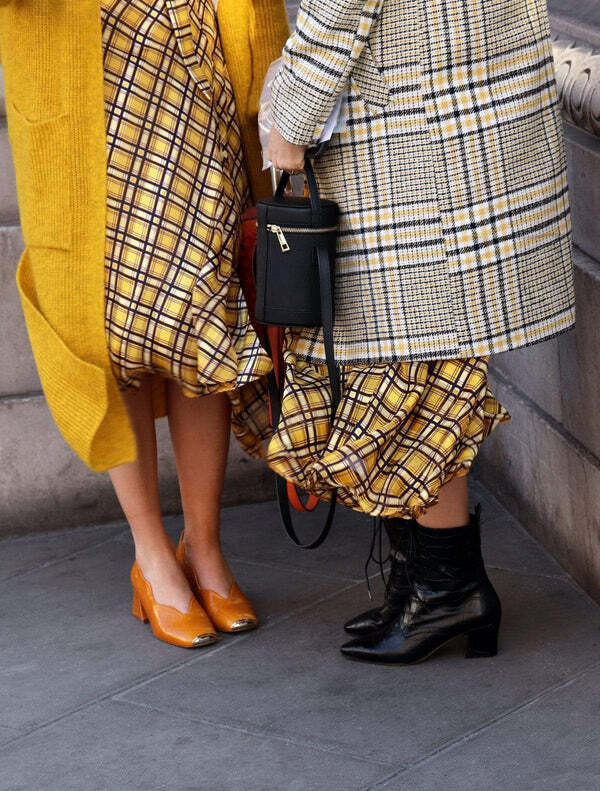 The sisters were wearing sixties-inspired looks around a yellow colour pallet. On the left, a yellow long line cardigan extends past the hem of the skirt accentuating the length of her legs. Whereas the tartan jacket and Victorian-style boots shape the body of the skirt on the right.